Follow @mcphoo Tweet Yesterday, b2d presented the first part of a this two part interview with Strong Guy Educator Brett Jones. Today, we focus more explicitly on the making of his latest co-production with Gray Cook, Club Swinging Essentials featuring Ed Thomas, one of America's leading figures in Indian Club swinging. I own i was particularly interested to talk with Brett about the project as i'd had the chance to comment on a penultimate draft of the manual that goes with DVD before it went to press. It was looking at the movements described in the book and the historical descriptions of indian clubs that peeked my interest. I also owe a debt to Joel Proskewitz of the Strength Company who hooked me up with some polyclubs to try out these moves in the UK. Thank you Joel. 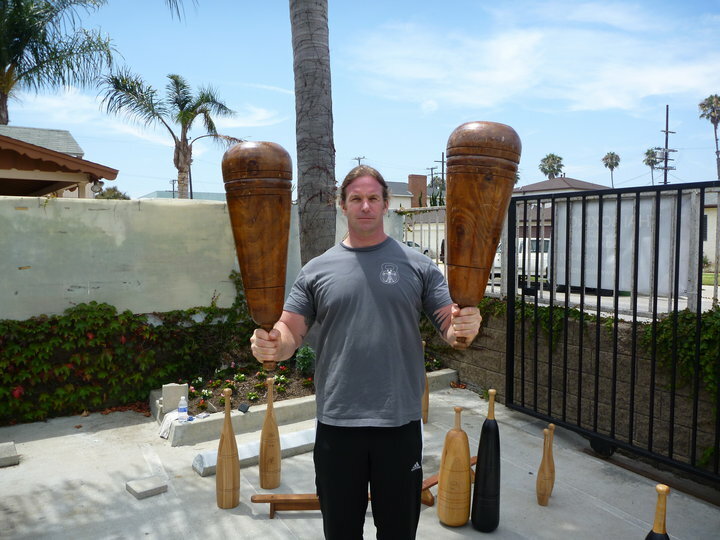 In this interview, you'll see that Brett advocates these light clubs for warm up and prehab, and that he and Cook use a novel strategy to teach 5 core moves from the Thomas approach to Indian Clubs. Yesterday we looked a little bit at Brett the Person. Let's talk a little shop about Brett as Business. Your web site /company is Applied Strength. What’s going on in the world of Applied Strength? Travel, Travel, Travel and some travel… Between teaching for the RKC, FMS and presenting at the Perform Better events I keep a very healthy travel schedule. Gray and I have a new product being released soon – Kettlebells from the Center – Dynami which is all about the power training with Kettlebells using the Swing and the Push-press. Other than that I am reading, practicing and getting my own training back in line after a surgery and recovery time. You have become the voice of the FMS in the RKC – How did you and Gray Cook hook up? What is important to you in this collaboration? I first met Gray Cook back in 1995 when I was an Athletic Trainer at a small military academy in Virginia (just happened to be in Gray’s home town). He walked into my training room one day and we started working together. I was also fortunate to be at the first FMS workshop in 1998. 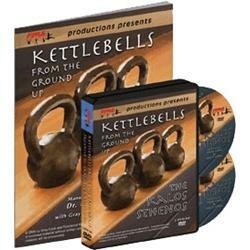 Gray and I lost touch for a few years and then reconnected in 2005 after the release of my first DVD with Michael Castrogiovanni [see b2d's interview with Michael] (Kettlebell Basics for Strength Coaches and Personal Trainers). After a session to prepare Danielle and Gray for the RKC I started teaching for FMS and working on the Advisory Board to progress the FMS. Having the chance to combine the FMS and RKC is a blending of the two of the best schools of thought available today. Both focus on movement quality. RKC is the premier School of Strength in the training industry and the FMS is brining movement quality and symmetry to the forefront. Together they represent a powerful combination. If you could convey one thing to folks about strength practice and making it meaningful/accessible to folks – What would you or do you say? “Beautiful Strength” Probably two words most people don’t associate with one another but strength in the end should be and can be beautiful. In Kettlebells from the Ground Up – Kalos Sthenos Gray Cook and I lay out what we think is a great way to begin working toward Kalos Sthenos (beautiful strength). The way I see it we could be talking about a Dancer, a Gymnast, a Runner (sprinting), a “Kettlebeller”, a Deadlifter, a Grappler, a Martial Artist etc…. the various forms of strength displayed can and should be beautiful. Also people should understand that strength is specific to the individual and we are all on our own paths to beautiful strength. But we should all be on the path. What is the biggest challenge you see for folks coming to a physical practice? How do you suggest most of these folks address that challenge? 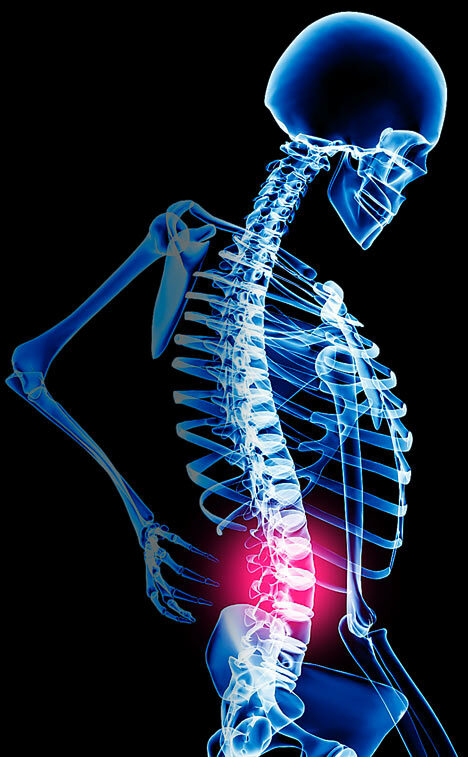 The biggest challenge I see for people getting started in a physical practice is the movement restriction, asymmetry and previous injury/history they bring to their new routine. A “locked” up ankle, a history of back pain (not current), or any number of physical issues can result in pain or injury as someone begins to “push” on these restricted areas. Clearing your movement foundation prior to asking for increased performance from the body is important. I recommend a Functional Movement Screen. A series of 7-movement pattern screens designed to find restriction, asymmetry and motor control issues. Then addressing any issues found with the appropriate corrective strategies. Taking time for screening and corrections and creating the right foundation for movement and exercise can be the difference between success and failure. Great Point. For more info, the CK-FMS and other movement assessment approaches like Z-health, Qi Gong, T'ai Chi, and the benefits of such active approaches to movement are indexed down this b2d page. Moving onto the Club Swinging Essentials project itself, let's get the obvious questions out of the way first: Ed Thomas has a lovely video on indian clubs that has been associated with indian clubs, polyclubs, etc for a few years now (nice overview on oldtimestrongman.com). Dragon Door also sells this with the polyclubs. How did he come to be involved with DragonDoor, and in particular yourself, Gray Cook and Functional Movement Inc? I first met Dr. Thomas [Ed.D., Curriculum & Supervision, Northern Illinois University, DeKalb, 1992, Emphasis in Health Promotion] in 2004 at the NSCA convention where he gave me my first pair of Indian Clubs and his DVD [a package that DragonDoor also sells]. Fast forward to 2009 when Gray arranged for an FMS staff training session with Dr. Thomas covering Breathing, Inversion, and Club Swinging among other things. Since that time I have been in contact with Dr. Thomas regarding Club Swinging and other aspects of training. We then filmed the Club Swinging Essentials DVD later in 2009 with it finally being released (after much editing with Dr. Thomas) in early 2010. Gray and I recognize that Dr. Thomas is essentially a National Treasure. His extensive study of physical education and physical culture, including yoga, martial arts, club swinging and Military fitness is unique to say the least. We wanted to tap into that body of knowledge. The three of you do about 5 moves on the DVD: are there more than these taught at the cert or is this project effectively the Certified Indian Club Specialist (CISC) Cert manual? The 5 essential movements from the Club Swinging Essentials DVD/Manual do form the “guts” of the CICS program but we add quite a bit after that. Detailed instructional break down and cueing of the movements, positions and postures. Group fitness structure and safety, along with additional preparatory moves, the elusive movement #6 and of course the experience of being there and receiving the instruction. Again Thomas’ video does more than the 5 on the DVD. How did you come to settle on these 5 movements and only these? 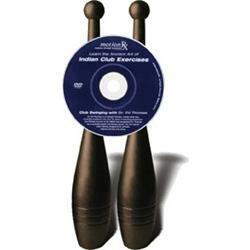 The 5 movements in Club Swinging Essentials lay the foundation for all other movements with the Indian Clubs. Similar to mastering a front kick in martial arts or basic stances and poses of Yoga or Tai Chi these 5 movements allow for someone to grasp the essentials that will lead to years of practice and skill development. They are integral to gaining familiarity with the Indian Club as well as regaining lost range of motion, efficiency and integrity of the arms and upper body. One of the questions that has come up around the cert/vid: Indian Clubs are what kindergarten kids used to do in school. Why do we need a certification or such an “intrigued” video (well beyond what Thomas does himself) to teach Indian Club basics? Well, what you don’t see on the video is the teacher in the background. The kids were not just “cut loose” with Indian Clubs (also known as War Clubs) and allowed to “swing away”. A teacher spent time to instruct and teach the children how to use the clubs. We “need” a certification for the experience, breakdowns, progressions and precision of Indian Club swinging to be transferred and continued. Just as the kids needed a teacher so do we. You guys on the vid make it pretty clear you’re just learning while doing this video. How much time did you actually have to test whether your variants of teaching Indian Clubs get better or do better things than just swinging clubs as per Dr. Thomas’ instruction prior to you guys getting on your knees? Gray and I have used Tall Kneeling and ½ Kneeling for years within the FMS corrective strategies so applying them to Indian Club swinging was a quick process for us. These positions allow us to not only create a new or novel learning environment where new information can be processed quicker but also allows us to target the hip and core motor control issues that can impact an individual’s Indian Club swinging. In fact one of Dr. Thomas’ students remarked at the first CICS that although he had his doubts about tall kneeling etc… he was very impressed with the results and would be implementing those positions in his own teaching. Again, y’all seem to be learning while doing on the DVD – so isn’t it a bit premature to be putting out a manual, or a “how to” before you’ve put the reps in yourselves on the material? And if it is “that easy” to get the hang of, that you can teach it without that expertise, doesn’t that beg the question of the product itself? We had and have the benefit of having Dr. Thomas as our teacher and expert supervisor for the DVD/Manual and our continued Club Swinging practice. It was essentially a year of dedicated practice prior to the CICS workshop (several months of practice prior to filming the DVD). So unless you have Dr. Thomas as your technical supervisor I wouldn’t recommend flying out to film. I also think it is important to see us learning and making mistakes since we are all on our different paths of progression. Club Swinging is a journey. Journey. Check. Now that those ones are out of the way, what was the mission with this DVD/manual? Protect the integrity of Dr. Thomas’ teaching and information. Expose the world to the benefits of Club Swinging as a restorative art. Provide structure and progression for Indian Club Swinging. Dr. Thomas’ DVD as you have noted provides a great number of movements but not a structure or progression to make Club Swinging more accessible. Gray and I feel we have done that. What do you really like about your DVD/manual? I love the fact that we got to capture a bit of Dr. Thomas’ knowledge and expertise. He has decades of practice and knowledge to share. I also like the fact that we were able to assist Dr. Thomas by providing some structure and progression to expose people once again to Indian Club swinging. What would you like to redo about it? Maybe my outfit or hair… Kidding, kidding… Funny thing is I look at all of my DVDs and products and see mistakes that I or Gray or whomever is making and wish I could go back and reshoot sections. For this product I would have liked for both Gray and I to perform the movements on camera so people could get another look at the movements. Is there a Vol. 2 coming? There more than likely will be a volume 2 but not for some time. 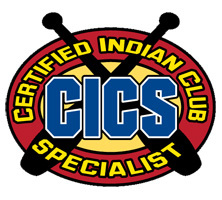 Where do Indian Clubs (IC’s) fit into your own practice? Indian Clubs are either “movement prep”, a combination with my Kettlebell practice or a stand-alone practice for the day. As movement prep I feel the ICs “rev up” my neurological system and open my shoulders (and hips if performed from tall and open ½ kneeling). One of my favorite workouts is to perform some Club Swinging and then a few KB Get-ups and keep alternating. As a stand-alone practice it is a chance to try to bring my body and mind back to center. While that may sound odd the concept of Indian Club swinging as a restorative art is an important one. We all push to accomplish certain goals. 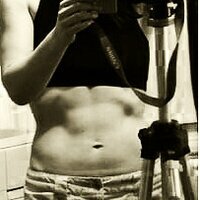 Pushing to achieve means putting stress on the body. Indian Clubs can be part of dealing with that stress and bringing the body back to a better place. What have they let you do that’s different from what you were doing for whatever that was prior to using them? For one thing my Left arm is way more useful than it used to be. Again that may sound odd but we all have a dominant arm and a “not so dominant” arm that isn’t all that skilled. Indian Clubs forced me to narrow the gap between my right and left arm. My shoulder mobility is also better than it has ever been. Where do you put IC’s into your training with clients? I use the Indian Clubs with clients much the same way I use them for myself. It is also a great way to introduce a lifelong learning project, work on movement skill and have fun. Perhaps another obvious question, but where do IC’s fit in with the KBs and barbell work? As stated, the Indian Club can provide movement prep, combinations and stand-alone practice (great for recovery days). Anyone needing more shoulder integrity, efficiency and mobility will benefit from adding in the Indian Clubs. Would you recommend incorporating them into team sport practice (say football, rugby, golf) why/why not? When and where? Yes. Indian Clubs lend themselves to coordinated, rhythmical and timed swinging in a group so they can be great for team cohesion and practice in working together as a team. As a warm up they can quickly bring the team together and get everyone working as unit. Interspersed during a practice they can stress working as a team while tired and staying mentally alert. As a cool down they again provide a great way for the team to come together and finish as a team. Lots of folks want to do the Big Clubs – what is your approach to sizing up or down with Indian clubs? Have you spent time with the big clubs yourself? Colleague Ken Froese of Kettlebell Evolution demo'ing some "meat tenderiser"
A very popular question. I am sure especially when people find out that the Clubs only weigh one or two pounds. As Dr. Thomas explains in the video, everyone started with light clubs to learn the movements and regain full function of the arms etc… Boxers and people wanting hand speed would stay with lighter clubs and grapplers and strength athletes would go heavier. I have used Scott Sonnon’s Clubbells (I had a 15 pound) but found that since I lift “heavy” with Kettlebells and Barbells I needed the restorative benefits of lighter Indian Club swinging. The Thomas approach is certainly the most established perhaps in the US system – since playing with Indian Clubs have you investigated other styles? Are there any that are particularly appealing to you? I really have not gone outside of Dr. Thomas’ system as of yet since I am still practicing and trying to master his system (which comes from many different sources) at a deeper level. This is an important point for people to grasp. If you try to master two systems within the same skill set a beginner will end up with motor learning confusion and fail to truly master either one. You need to dedicate time to learn and go deep within a system before going out for another. I will reach a point where I will want to go out to do other systems but am diving deep into this one for my current journey. We've seen Soviet KB training introduced to North America over the past ten years. Now we're seeing this re-appearance of Indian Clubs - something that was part of the scene into the early 20thC. What do you see as the next likely tool to make a comeback? Rope Climbing perhaps? Off the Ground training will likely be the next “big thing” and I think Inversion training will experience a come back. In the old Turnverein method [german version] [us version], training off the ground was seen as an essential component of getting “fit”. Inversion, brachiation, and other forms of off the ground training help us to experience gravity in a different way and help us fight the negative effects of constantly being pulled down by it. Ok, sounds vaguely parkour-ish. Cool. In wrapping up, Brett, what would you like to see happen in people's physical education? One of the great things about Indian Clubs is that they are an opportunity to learn not just “workout”. The workout should come from going to the gym to learn. When was the last time you went to the gym to learn? That is one of the things that I would like to see happen in folks physical education – bring the “education” back. Thanks for your time Brett. Best with your travels. Brett will be teaching the second Certified Indian Club Specialist workshop March 12-13 in Minnesota. How get strong if our muscles aren't firing? Love the clubs too! I have both the poly and wood clubs. I prefer the organic feel and look of wood though. I purchased the Cook/Jones/Jones workbook and DVD. The workbook is disappointing--I felt like it was rushed out just to capitalize on the growing interest in club swinging. The pages at the back of Thomas are mere fillers with font too small to actually read--my own personal opinion of course. I have not watched all the DVD yet, but there appears to be some good content there albeit a different approach than other club teachers which is fine. I also have the Scott Sonnon and Army Maguire club materials and will be reviewing them in depth as well. Your photo of Ken holding the heavy clubs was taken at the Insanto Academy. The heavy clubs belonged to Army Maguire who can actually move them with some aesthetic power--he has some nice video clips posted on heavy clubs you might want to also check out. Move well and Club on!